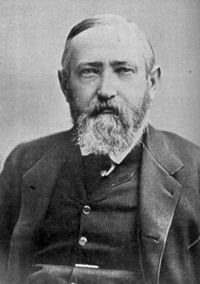 Benjamin Harrison ( August 20, 1833 – March 13, 1901) was the 23rd President of the United States, serving one term from 1889 to 1893. He had previously served as a senator from Indiana. Nicknames such as "Kid Gloves" and "Little Ben" were mocking titles given by his political rivals. A grandson of President William Henry Harrison and great-grandson of Benjamin Harrison V, Benjamin was born on August 20, 1833, in North Bend, Hamilton County, Ohio as the second of eight children of John Scott Harrison (later a U.S. Congressman from Ohio) and Elizabeth Ramsey Irwin. He attended Miami University, Oxford, Ohio, where he was a member of the fraternity Phi Delta Theta, (later in life, he joined Delta Chi) and graduated in 1852. He studied law in Cincinnati, Ohio, then moved to Indianapolis, Indiana in 1854. He was admitted to the bar and became reporter of the decisions of the Indiana Supreme Court. Harrison served in the Union Army during the Civil War, and was appointed Commander of the 70th Indiana Volunteer Infantry Regiment in August 1862. The unit performed reconnaissance duty and guarded railroads in Kentucky and Tennessee until Sherman's Atlanta Campaign in 1864. Harrison was brevetted as a brigadier general, and commanded a Brigade at Resaca, Cassville, New Hope Church, Lost Mountain, Kennesaw Mountain, Marietta, Peach Tree Creek, and the Siege of Atlanta. Harrison was later transferred to the Army of the Cumberland and participated in the Siege of Nashville and the Grand Review in Washington D.C. before mustering out in 1865. While in the field in October 1864, he was re-elected reporter of the Ohio State Supreme Court and served four years. He was an unsuccessful Republican candidate for governor of Indiana in 1876. He was appointed a member of the Mississippi River Commission, in 1879, and elected as a Republican to the United States Senate, where he served from March 4, 1881, to March 4, 1887. He was chairman of the U.S. Senate Committee on Transportation Routes to the Seaboard ( 47th Congress) and U.S. Senate Committee on Territories ( 48th and 49th Congresses). Harrison was married twice. On October 20, 1853, he married Caroline Lavina Scott (1832-1892). They had two children who lived to adulthood, Russell Benjamin Harrison (1854-1936) and Mary Harrison McKee (1858-1930), as well as a daughter who died very shortly after birth in 1861. After Caroline Harrison's death of tuberculosis in 1892 while Harrison was in office, he married his wife's widowed niece and former secretary Mary Scott Lord Dimmick (1858-1948) on April 6, 1896. They had one daughter, Elizabeth Harrison (1897-1955). "What can I do when both parties insist on kicking?" After beating John Sherman for the Republican presidential nomination, Harrison was elected President of the United States in 1888. In the Presidential election, Harrison received 100,000 fewer popular votes than incumbent President Grover Cleveland but carried the Electoral College 233 to 168. Although Harrison had made no political bargains, his supporters had given innumerable pledges upon his behalf. When Boss Matthew Quay of Pennsylvania heard that Harrison ascribed his narrow victory to Providence, Quay exclaimed that Harrison would never know "how close a number of men were compelled to approach...the penitentiary to make him President." He was inaugurated on March 4, 1889, and served through March 4, 1893. Harrison was also known as the "centennial president" because his inauguration was the 100th anniversary of the inauguration of George Washington. For Harrison, Civil Service reform was a no-win situation. Congress was split so far apart on the issue that agreeing to any measure for one side would alienate the other. The issue became a popular political football of the time and was immortalized in a cartoon captioned "What can I do when both parties insist on kicking?" Harrison was proud of the vigorous foreign policy which he helped shape. The first Pan-American Congress met in Washington, D.C. in 1889, establishing an information centre which later became the Pan American Union. At the end of his administration, Harrison submitted to the Senate a treaty to annex Hawaii; to his disappointment, President Cleveland later withdrew it. Harrison tried to make the tariff more acceptable by writing in reciprocity provisions. To cope with the Treasury surplus, the tariff was removed from imported raw sugar; sugar growers within the United States were given two cents per pound bounty on their production. Long before the end of the Harrison Administration, the Treasury surplus had evaporated and prosperity seemed about to disappear. Congressional elections in 1890 went against the Republicans, and party leaders decided to abandon President Harrison, although he had cooperated with Congress on party legislation. Nevertheless, his party renominated him in 1892, but he was defeated by Cleveland. Just 2 weeks earlier, on October 25, 1892, Harrison's wife, Caroline died after a long battle with tuberculosis. When North and South Dakota were admitted to the Union, Harrison covered the tops of the bills and shuffled them so that he could only see the bottom. Thus, it is impossible to tell which was signed first, and which was the 39th and the 40th. After he left office, Harrison returned to Indianapolis and remarried. He went to the First Peace Conference at The Hague. He served as an attorney for the Republic of Venezuela in the boundary dispute between Venezuela and the United Kingdom in 1900. Harrison developed the flu and a bad cold in February 1901. Despite treatment by steam vapor inhalation, Harrison's condition only worsened. Benjamin Harrison eventually died from influenza and pneumonia on Wednesday, March 13, 1901 and is interred in Crown Hill Cemetery. The Benjamin Harrison Law School in Indianapolis was named in his honour. In 1944, Indiana University acquired the school and renamed it Indiana University School of Law Indianapolis. At Miami University, Harrison Hall houses the political science department and the Harrison Scholarship is school's most prestigious academic award. In 1942, a United States Liberty ship named the SS Benjamin Harrison was launched. She was torpedoed and scuttled in 1943. A U.S. Army base, Fort Benjamin Harrison, was established after Harrison's death in Indianapolis, but it was closed in the 1990s. Harrison Hall, a co-educational dormitory at Purdue University, is named after President Harrison, who served on the Board of Trustees of Purdue University from July 1895 to March 1901. 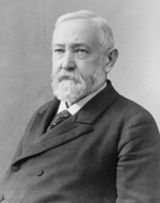 Benjamin Harrison is the only President with the distinction of being a grandson of a past President. 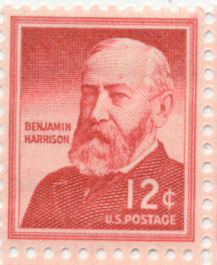 Benjamin Harrison might be the first President whose voice was recorded. This recording, which was originally made on a phonograph cylinder, can be accessed here. Harrison was the last President to wear a beard while in office but not the last to sport facial hair. Grover Cleveland, Theodore Roosevelt and William Howard Taft all had moustaches. Harrison had electricity installed in the White House for the first time, but he and his wife reportedly would not touch the light switches for fear of electrocution. In April 1891, Harrison became the first President to travel across the United States entirely by train. On June 7, 1892, Harrison became the first President to ever attend a baseball game. Harrison's roommate at Miami University, John Alexander Anderson, became a six-term U.S. Congressman from Kansas and the second President of Kansas State University. Harrison appointed him general consul to Cairo, Egypt. In 1892, Harrison and Whitelaw Reid formed the only U.S. presidential ticket composed of candidates that were also alumni of the same university, Miami University. Like Harrison, Reid also has a building on Miami's campus named for him. Reid Hall is a dormitory.